This excursion takes place near the settlement Vishnevogorsk (Southern Ural). Spend the night in tents on the bank of lake Arakul or in a hotel in the town Kyshtym. - Amazonite mines near the village Purgino where it is possible to collect excellent samples of amazonite. - Sphene vein of Svistunov broad gully, where is possible to collect some alkaline minerals: nepheline, cancrinite (for the first time it was described in Vishnevogorsk alkaline complex), microcline, biotite, zircon, egyrine, arfvedsonite, sphene. 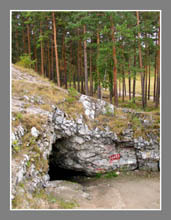 - Feldspar mine of Kurochkin broad gully. Picking up of samples of microcline, nepheline, biotite, apatite, zircon, sphene, cancrinite, ilmenite etc. - Veins of mountain Karavaj (“the Loaf”) – a place of first find of mineral vishnevit. Picking up of samples of microcline, pyrochlore, nepheline, apatite, zircon, sphene, ilmenite, vishnevit etc. In dependence on the water level – visiting of old galleries, whence the largest zircons of southern Ural were mined. - Visiting of "pyrochlore" quarries and gallery. Picking up of samples of microcline, pyrochlore, calcite, corundum, sphene, quartz, arfvedsonite etc. - Buldymskoe vermiculite deposit near lake Buldymskoe. - The lake Arakul with the 80 m stone wall “Shikhan” on the bank of it – the best place for spending the night in time of 2-day excursion.